“The clock is ticking to provide your comments to the Ministry of Environment re: proposed contaminated soil storage near Campbell River’s drinking water supply. See CREC’s list of concerns and supporting scientific evidence – and how to make your voice heard – here: bit.ly/2FMZBNr” Watch Sonia Furstenau in the BC Legislature on this issue. Powell River has LOTS of events for Earth Month. Check them out here. Mark de Bruijn, NIPR’s Green Party 2019 candidate, is going to be in attendance at the Powell River Earth Day festivities, as a guest of We are Climate Action Powell River. Mark will be there from 11 a.m. to 3 p.m., and will be speaking from 12:45 to 1 pm. If you’re heading over to Powell River, make sure you stop by and say “Hey” to Mark! Show your support for Campbell River youth and local environmental initiatives by attending this year’s Earth Week Film Festival! Admission is by donation at the door, and proceeds from the event will support a post-secondary environmental bursary for a graduating School District 72 student. Campbell River’s Youth Action Committee is helping to coordinate this year’s festival, Read about the films here. The Regional District TRASH BASH is Saturday, May 4th, but you can clean up local trails, beaches and dump sites anytime before then. Bring the collected illegally dumped trash to Willingdon gravel field May 4th for free disposal and enjoy a thank you lunch (12-1:30), along with prize draw (1:00)! Back to basics last year and this, so no items from home, please. The only exception this year, are car tires. We will be hosting a BC Tire Stewardship TIRE ROUND-UP where residents (and volunteers who have collected illegally dumped tires) are welcomed to bring tires for free disposal. Thanks for your participation! This is a sobering read given the BC NDP’s recent decision to give millions of dollars in subsidies to LNG. Especially concerning is the amount of water used by fracking. In a warming global climate reality, water - which is essential for life - is going to become increasingly scarce and precious. Wars will be fought over it. For any government to allow a polluting industry to take vast amounts of pristine water out of circulation forever - and contaminate it forever - ought to be criminal. Read more. This article illustrates the pressure many First Nations are under to make near-impossible choices in an attempt to preserve what they can of their culture and heritage by taking money from the oil and gas industry. Excerpt: “We’ve been messed up. Effed up by the colonizers for 150 years and they’re still doing it. They may say that they want to reconcile and all that, but they want us to reconcile,” he said, taking a moment to laugh and shrug his shoulders. “And forgive them for all the stuff that they did to us. But I think they’ve done so much damage that it’s going to be really difficult. It’s going to take several generations to overcome it. In fact, the damage is so bad I don’t know if we can. And you can quote me on that.” The band is struggling to cope with poverty. It wasn’t hard to make a decision to sign onto the LNG project. If there was nothing left, what was there to lose, was the reasoning for the collective decision to sign on, Patrick said…No amount of money, however, will ever be enough to repair the damage to the land and people by colonizers, settlers, governments and industry, explained hereditary Chief Geraldine Gunanoot….Today we need compensation for everything that was done before and that’s just a small token to give back for something that can revive our identity,” she said in an interview. “If the industry today offers us something, yes, we will gracefully take it and we will use it to revive what has been taken from us. It’s not like they’re doing something great for us. But it is acceptable to us.” Read more. Event Description: As part of the lead up to the 2019 federal general election - members of shadow cabinet will be hosting webinars on areas of policy related to their portfolios. Watch Elizabeth May’s Point of Order about the problematic, non-budgetary issues that are included in the Liberals’ omnibus budget. Specifically, she references substantial amendments to refugee and immigration law when only the Finance Committee will be reviewing the budget bill. You will recall the Liberals promised to end omnibus bills in the campaign in 2015. Also read this Maclean’s article on that same omnibus bill and how the Liberals’ new stance on refugees and immigration is closely akin to traditionally Conservative territory. Watch Elizabeth May speak to this bill, which is “an act to amend the MacKenzie Valley Resource Management Act and the Canada Petroleum Resources Act. This bill is a hold-over from the 41st Parliament, and Elizabeth May opposed it then. The First Nations people in the area affected feel it violates principles of Nation-to-Nation consultation, and violates the principles of the Northwest Territories Devolution Act was supposed to respect. This video is worth listening to because Elizabeth references various other bills as well. This is the Facebook banner for the Milton Greens. What do you think of it as an election slogan? David Frum, son of the renowned Canadian news anchorwoman Barbara Frum, is a big deal in the USA…not only because he coined the term ‘axis of evil’ and worked inside presidential administrations, but because he is a hugely knowledgeable and widely respected staff writer for The Atlantic, one of the more prestigious American publications. Here is his take on what is happening in Canada now, and how he has portrayed it to the American audience. Always interesting to see ourselves through the eyes of others! “Indigenous women have always been specifically targeted by colonial violence. You can see evidence of this in the Indian Act, which legislated Indigenous women who married non-Indigenous men, as well as their children, out of their nations and communities until 1985. Gender discrimination still hasn’t been fully removed from the Indian Act, with current Minister of Crown-Indigenous Relations Carolyn Bennett fear-mongering about the possibilities of “hundreds of thousands, or even millions, of new Indigenous people” now needing funding under the Indian Act. Apparently Canada should be concerned about what it would mean if Indigenous women were legally given the same rights as Indigenous men.” Read more. These two authors “set out to assemble a dataset of bike routes in Canadian cities using their open data websites. But we found it was nearly impossible to keep it up-to-date because cities are constantly changing and the data are shared using different standards. The solution was OpenStreetMap, which creates and distributes free geographic data. Anyone can add data or make edits to OpenStreetMap, whether they want to build a better bike map or make a navigation app….The exciting thing is that anyone who wants a better bike map — city planners, researchers and everyday riders — can join the bike-mapping revolution by logging in to OpenStreetMap and mapping the features that are important to bicyclists.” Read more. “The Act to Support Gay-Straight Alliances received royal assent in December 2017 and then came into effect April 1, 2018. This act requires all publicly funded schools to create welcoming, caring and respectful policies and make the policies publicly available, and ensures principals help students create a GSA in a timely manner when one is requested. Further, the act ensures schools comply with the law. Schools that do not put in place a relevant written policy and code of conduct, or who disallow the formation of a GSA, are subject to removal of public funding...But GSAs have come into United Conservative Party (UCP) leader Jason Kenney’s crosshairs. One of his campaign promises is to roll back GSA legislation: Kenney has proposed allowing school officials to notify parents when their child joins a GSA. Such a move could jeopardize student safety. A political candidate threatening to remove important protections for some of our province’s most vulnerable students may well turn off many voters.” Read more. Are agri-corporations going to end up with even more control of our food supply? Who is going to receive and control all this data? Will marginalized workers have even less secure futures? Excerpt: “The Canadian government is investing heavily in climate-smart and precision agricultural technologies (ag-tech). These combine digital tools such as GPS and sensors with automated machines like smart tractors, drones and robots in an attempt to increase farm profits while reducing pesticide and fertilizer use. GPS mapping of crop yields and soil characteristics help to cut costs and increase profits, so while seeds still grow in soil, satellites are increasingly part of the story. There’s no doubt that ag-tech may be promising for governments, investors and corporations, but the benefits are far less clear for farm owners and workers.” Read more. “Newfoundland and Labrador says public consultations found 87 per cent were in favour of a ban.” Read more. It is astonishing that this is still being litigated in 2019, and tobacco companies are still trying to get out of taking any responsibility for knowingly causing the deaths of millions. Read more. Really?! Wouldn’t it stimulate the economy much more AND provide local jobs if that $12 million was given to homeowners to install solar panels? Or to small businesses who would benefit from having lower overhead costs? Loblaws has multi-million dollar profits each year and doesn’t need ‘incentives’ from the government. It also has admitted to fixing the price of bread, of all things, refusing to pay livable wages, and parks its money offshore. If our governments made our taxpayer subsidies carry some moral weight, perhaps some of these large corporations would reconsider their practices. Read more. The deadline for submitting formal proposals was September 28, 2018. Some decisions are still pending and we expect to notify all applicants of funding decisions in the coming months. The deadline for submitting applications was March 8, 2019. The government will notify applicants of funding decisions later in 2019. Science Unstained members celebrated Edinburgh Science’s commitment to reject fossil fuel sponsorship, 2 Apr 2019. Photo: Ric Lander. “The charity that runs the Edinburgh International Science Festival has announced it will no longer accept funding from fossil fuel companies. Activists had promised to run a series of pro-science protest actions during the 2019 festival regarding funds the charity had accepted from Exxon and Total. In a statement the Edinburgh Science Festival said “the sector is not moving fast enough to meet the IPCC targets and that there is a conflict between their behaviour and the underlying science.”…“Sponsoring educational and cultural organisations is a cheap and effective means of improving their public image while continuing to destroy the earth. The decision by Edinburgh Science to drop fossil fuel sponsorship is an important and necessary step for upholding their scientific integrity.”” Read more. Excerpt: “The Guardian will now publish the Mauna Loa carbon count, the global [CO2] benchmark, on the weather page of the paper every day. “When I read the letter from Guardian reader Daniel Scharf encouraging us to include information on climate change in our weather forecasts, we thought it was a fantastic idea,’ said the Guardian’s editor-in-chief, Katharine Viner. ‘Levels of carbon dioxide in the atmosphere have risen so dramatically, and including a measure of that in our daily weather report is symbolic of what human activity is doing to our climate. People need reminding that the climate crisis is no longer a future problem – we need to tackle it now, and every day matters. While weather changes daily, climate changes over years and decades. So alongside the daily carbon count, we will publish the level in previous years for comparison, as well as the pre-industrial baseline of 280ppm, and the level seen as manageable in the long term of 350ppm. Year-on-year comparisons are important because each year there is a natural rise and fall of CO2 levels, rather like the planet breathing. Trees and plants absorb carbon and release oxygen as they grow, lowering atmospheric CO2.” Read more. “ExxonMobil faces losing its lobby privileges at the European parliament after the company failed to show up for the first hearing into climate change denial. ExxonMobil would become only the second multinational – after Monsanto – to lose access to MEPs, parliamentary meetings and digital resources if it loses a high-level vote expected by the end of April. The oil giant publicly supports the Paris agreement but has drawn the ire of scientists, academics and environmentalists, who accuse it of peddling climate misinformation. The ban request is being submitted by the Green MEP Molly Scott Cato. She said: “This is the company that denied the science, despite knowing the damage their oil exploitation was causing; which funded campaigns to block action on climate and now refuses to face up to its environmental crimes by attending today’s hearing. We cannot allow the lobbyists from such corporations free access to the corridors of the European parliament. We must remove their badges immediately.” The ban request is being submitted by the Green MEP Molly Scott Cato.” Read more. “Royal Dutch Shell, one of the world’s biggest oil companies, recently said it had dropped out of a Washington D.C. industry lobbying group, American Fuel & Petrochemical Manufacturers, or AFPM. Why? Because Shell supports the Paris Agreement on climate change and the lobbying group doesn’t. ‘We must be prepared to openly voice our concerns where we find misalignment with an industry association on climate-related policy,” wrote Shell’s CEO Ben Van Beurden. ‘In cases of material misalignment, we should also be prepared to walk away.’” Read more. “With domestic housing high on the government’s agenda, it is time the construction industry recognised the economic and environmental benefits of bio-based construction materials and became less reliant on depleting resources including oil and steel.” Read more. Many people want to bring back salmon, but this story shows what a difficult choice that can create. Read more. Patagonia released a trailer for ‘Artifishal,’ its latest film about wild fish and the environments surrounding them. With an in-depth and controversial look at fish hatcheries and fish farms, this film appears to be quite revealing. Read more here. 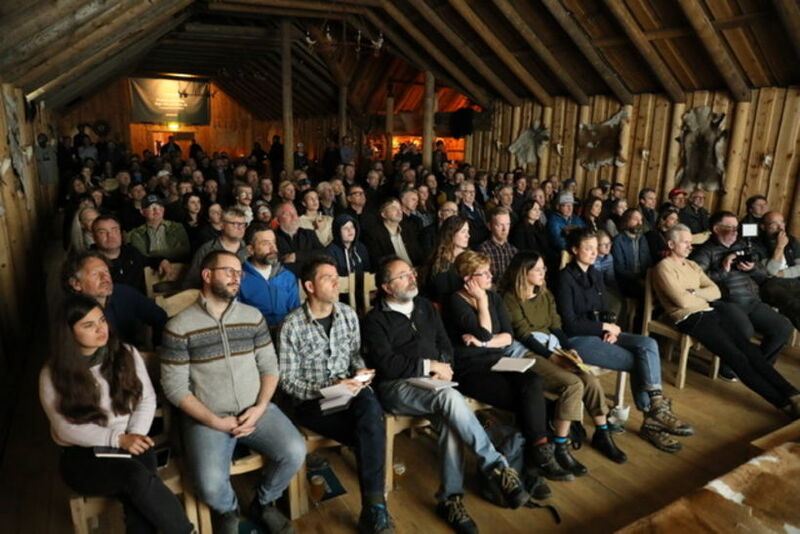 The European premiere of the film took place in Ingólfsskáli, near Hveragerði, South Iceland, Wednesday night and was well attended. “The fossil fuel industry regularly deploys manipulative and dishonest tactics when engaging with communities of color, often working to co-opt the respect and authority of minority-led groups to serve corporate goals. That is according to a new report, “Fossil Fueled Foolery,” published today by the National Association for the Advancement of Colored People (NAACP), which outlines the top 10 manipulation tactics that the group’s members and partners routinely observe.” Read more.